As development of land and water resources intensifies, it is increasingly apparent that development of either ground water or surface water affects the other (Winter and others, 1998). Some particular aspects of the interaction of ground water and surface water that affect the sustainable development of ground-water systems are discussed below for various types of surface-water features. As development of land and water resources intensifies, it is increasingly apparent that development of either ground water or surface water affects the other. Streams either gain water from inflow of ground water (gaining stream; Figure 12A) or lose water by outflow to ground water (losing stream; Figure 12B). Many streams do both, gaining in some reaches and losing in other reaches. Furthermore, the flow directions between ground water and surface water can change seasonally as the altitude of the ground-water table changes with respect to the stream-surface altitude or can change over shorter timeframes when rises in stream surfaces during storms cause recharge to the streambank. Under natural conditions, ground water makes some contribution to streamflow in most physiographic and climatic settings. Thus, even in settings where streams are primarily losing water to ground water, certain reaches may receive ground-water inflow during some seasons. Losing streams can be connected to the ground-water system by a continuous saturated zone (Figure 12B) or can be disconnected from the ground-water system by an unsaturated zone (Figure 12C). An important feature of streams that are disconnected from ground water is that pumping of ground water near the stream does not affect the flow of the stream near the pumped well. Gaining streams (A) receive water from the ground-water system, whereas losing streams (B) lose water to the ground-water system. For ground water to discharge to a stream channel, the altitude of the water table in the vicinity of the stream must be higher than the altitude of the stream-water surface. Conversely, for surface water to seep to ground water, the altitude of the water table in the vicinity of the stream must be lower than the altitude of the stream surface. Some losing streams (C) are separated from the saturated ground-water system by an unsaturated zone. A pumping well can change the quantity and direction of flow between an aquifer and stream in response to different rates of pumping. Figure 13 illustrates a simple case in which equilibrium is attained for a hypothetical stream-aquifer system and a single pumping well. The adjustments to pumping of an actual hydrologic system may take place over many years, depending upon the physical characteristics of the aquifer, degree of hydraulic connection between the stream and aquifer, and locations and pumping history of wells. 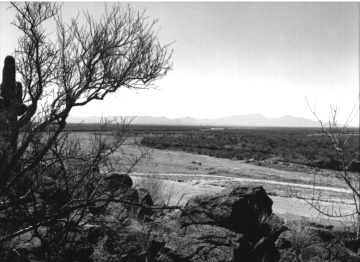 Reductions of streamflow as a result of ground-water pumping are likely to be of greatest concern during periods of low flow, particularly when the reliability of surface-water supplies is threatened during droughts. At the start of pumping, 100 percent of the water supplied to a well comes from ground-water storage. Over time, the dominant source of water to a well, particularly wells that are completed in an unconfined aquifer, commonly changes from ground-water storage to surface water. The surface-water source for purposes of discussion here is a stream, but it may be another surface-water body such as a lake or wetland. The source of water to a well from a stream can be either decreased discharge to the stream or increased recharge from the stream to the ground-water system. The streamflow reduction in either case is referred to as streamflow capture. In the long term, the cumulative stream- flow capture for many ground-water systems can approach the quantity of water pumped from the ground-water system. This is illustrated in Figure 14, which shows the time-varying percentage of ground-water pumpage derived from ground-water storage and the percentage derived from streamflow capture for the hypothetical stream-aquifer system shown in Figure 13. The time for the change from the dominance of withdrawal from ground-water storage to the dominance of streamflow capture can range from weeks to years to decades or longer. Under natural conditions (A), recharge at the water table is equal to ground-water discharge to the stream. Assume a well is installed and is pumped continuously at a rate, Q1, as in (B). After a new state of dynamic equilibrium is achieved, inflow to the ground-water system from recharge will equal outflow to the stream plus the withdrawal from the well. In this new equilibrium, some of the ground water that would have discharged to the stream is intercepted by the well, and a ground-water divide, which is a line separating directions of flow, is established locally between the well and the stream. If the well is pumped at a higher rate, Q2, a different equilibrium is reached, as shown in (C). 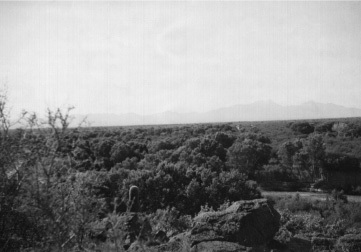 Under this condition, the ground-water divide between the well and the stream is no longer present, and withdrawals from the well induce movement of water from the stream into the aquifer. Thus, pumping reverses the hydrologic condition of the stream in this reach from ground-water discharge to ground-water recharge. Note that in the hydrologic system depicted in (A) and (B), the quality of the stream water generally will have little effect on the quality of ground water. In the case of the well pumping at the higher rate in (C), however, the quality of the stream water can affect the quality of ground water between the well and the stream, as well as the quality of the water withdrawn from the well. Although a stream is used in this example, the general concepts apply to all surface-water bodies, including lakes, reservoirs, wetlands, and estuaries. From a sustainability perspective, the key point is that pumping decisions today will affect surface-water availability; however, these effects may not be fully realized for many years. Most ground-water development is much more complex than implied in Figure 13; for example, it may comprise many wells pumping from an aquifer at varying pumping rates and at different locations within the ground-water-flow system. Computer models commonly are needed to evaluate the time scale and time-varying response of surface-water bodies to such complex patterns of ground-water development. From a sustainability perspective, the key point is that pumping decisions today will affect surface-water availability; however, these effects may not be fully realized for many years. The eventual reduction in surface-water supply as a result of ground-water development complicates the administration of water rights. Traditionally, water laws did not recognize the physical connection of ground water and surface water. Today, in parts of the Western United States, ground-water development and use are restricted because of their effects on surface-water rights. Accounting for the effects of ground-water development on surface-water rights can be difficult. For example, in the case of water withdrawn to irrigate a field, some of the water will be lost from the local hydrologic system due to evaporation and use by crops, while some may percolate to the ground-water system and ultimately be returned to the stream. Related questions that arise include: how much surface water will be captured, which surface-water bodies will be affected, and over what period will the effects occur? Some of these issues are illustrated further in Box C.
Figure 14. The principal source of water to a well can change with time from ground-water storage to capture of streamflow. The percentage of ground-water pumpage derived from ground-water storage and capture of streamflow (decrease in ground-water discharge to the stream or increase in ground-water recharge from the stream) is shown as a function of time for the hypothetical stream-aquifer system shown in Figure 13. A constant pumping rate of the well is assumed. For this simple system, water derived from storage plus streamflow capture must equal 100 percent. The time scale of the curves shown depends on the hydraulic characteristics of the aquifer and the distance of the well from the stream. Ground-water pumping can affect not only water supply for human consumption but also the maintenance of instream-flow requirements for fish habitat and other environmental needs. Long-term reductions in streamflow can affect vegetation along streams (riparian zones) that serve critical roles in maintaining wildlife habitat and in enhancing the quality of surface water. Pumping-induced changes in the flow direction to and from streams may affect temperature, oxygen levels, and nutrient concentrations in the stream, which may in turn affect aquatic life in the stream. In gaining and in losing streams, water and dissolved chemicals can move repeatedly over short distances between the stream and the shallow subsurface below the streambed. The resulting subsurface environments, which contain variable proportions of water from ground water and surface water, are referred to as hyporheic zones (see Figure 15). Hyporheic zones can be active sites for aquatic life. For example, the spawning success of fish may be greater where flow from the stream brings oxygen into contact with eggs that were deposited within the coarse bottom sediment or where stream temperatures are modulated by ground-water inflow. The effects of ground-water pumping on hyporheic zones and the resulting effects on aquatic life are not well known. Streambeds are unique environments where ground water that drains much of the subsurface of landscapes interacts with surface water that drains much of the surface of landscapes. Mixing of surface water and ground water takes place in the hyporheic zone where microbial activity and chemical transformations commonly are enhanced. Lakes, both natural and human made, are present in many different parts of the landscape and can have complex ground-water-flow systems associated with them. Lakes interact with ground water in one of three basic ways: some receive ground-water inflow throughout their entire bed; some have seepage loss to ground water throughout their entire bed; and others, perhaps most lakes, receive ground-water inflow through part of their bed and have seepage loss to ground water through other parts. 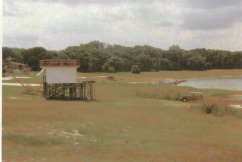 Lowering of lake levels as a result of ground-water pumping can affect the ecosystems supported by the lake (Figure 16), diminish lakefront esthetics, and have negative effects on shoreline structures such as docks. As part of efforts to prevent significant undesirable environmental consequences from water-resources development, water-management agencies in Florida are defining minimum flows and water levels for priority surface waters and aquifers in the State. For lakes, the minimum flows and water levels describe a hydrologic regime that is less than the historical or optimal one but allows for prudent water use while protecting critical lake functions. As an example, five possible minimum water levels defined for a lake are shown in A. An elevation and a percentage of time the level is exceeded characterize each of these levels. The upper curve in B shows the percentage of the time that the lake is historically above each corresponding level. The goal is to ensure that water withdrawals and other water-resource management actions continue to allow the lake water levels to be at or above the minimum levels shown by the lower curve in B for the percentage of time shown. 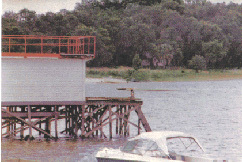 Dock on Crooked Lake in central Florida in the 1970's. The same dock in 1990. The chemistry of ground water and the direction and magnitude of exchange with surface water significantly affect the input of dissolved chemicals to lakes. In fact, ground water can be the principal source of dissolved chemicals to a lake, even in cases where ground-water discharge is a small component of a lake's water budget. Changes in flow patterns to lakes as a result of pumping may alter the natural fluxes to lakes of key constituents such as nutrients and dissolved oxygen, in turn altering lake biota, their environment, and the interaction of both. Wetlands are present wherever topography and climate favor the accumulation or retention of water on the landscape. Wetlands occur in widely diverse settings from coastal margins to flood plains to mountain valleys. Similar to streams and lakes, wetlands can receive ground-water inflow, recharge ground water, or do both. Wetlands are in many respects ground-water features. Public and scientific views of wetlands have changed greatly over time. Only a few decades ago, wetlands generally were considered to be of little or no value. It is now recognized that wetlands have beneficial functions such as wildlife habitat, floodwater retention, protection of the land from erosion, shoreline protection in coastal areas, and water-quality improvement by filtering of contaminants. The persistence, size, and function of wetlands are controlled by hydrologic processes (Carter, 1996). For example, the persistence of wetness for many wetlands is dependent on a relatively stable influx of ground water throughout changing seasonal and annual climatic cycles. Characterizing ground-water discharge to wetlands and its relation to environmental factors such as moisture content and chemistry in the root zone of wetland plants is a critical but difficult to characterize aspect of wetlands hydrology (Hunt and others, 1999). Wetlands can be quite sensitive to the effects of ground-water pumping. Ground-water pumping can affect wetlands not only as a result of progressive lowering of the water table, but also by increased seasonal changes in the altitude of the water table. The amplitude and frequency of water-level fluctuations through changing seasons, commonly termed the hydroperiod, affect wetland characteristics such as the type of vegetation, nutrient cycling, and the type of invertebrates, fish, and bird species present. The effects on the wetland environment from changes to the hydroperiod may depend greatly on the time of year at which the effects occur. For example, lower than usual water levels during the nongrowing season might be expected to have less effect on the vegetation than similar water-level changes during the growing season. The effects of pumping on seasonal fluctuations in ground-water levels near wetlands add a new dimension to the usual concerns about sustainable development that typically focus on annual withdrawals (Bacchus, 1998). Springs typically are present where the water table intersects the land surface. Springs serve as important sources of water to streams and other surface-water features, as well as being important cultural and esthetic features in themselves. 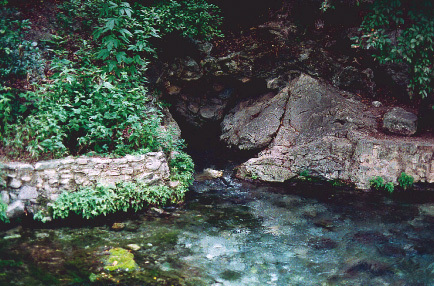 The constant source of water at springs leads to the abundant growth of plants and, many times, to unique habitats. Ground-water development can lead to reductions in springflow, changes of springs from perennial to ephemeral, or elimination of springs altogether. Springs typically represent points on the landscape where ground-water-flow paths from different sources converge. Ground-water development may affect the amount of flow from these different sources to varying extents, thus affecting the resultant chemical composition of the spring water. Coastal areas are a highly dynamic interface between the continents and the ocean. The physical and chemical processes in these areas are quite complex and commonly are poorly understood. Historically, concern about ground water in coastal regions has focused on seawater intrusion into coastal aquifers, as discussed in a later chapter of this report. More recently, ground water has been recognized as an important contributor of nutrients and contaminants to coastal waters. Likewise, plant and wildlife communities adapted to particular environmental conditions in coastal areas can be affected by changes in the flow and quality of ground-water discharges to the marine environment. In summary, we have seen that changes to surface-water bodies in response to ground-water pumping commonly are subtle and may occur over long periods of time. The cumulative effects of pumping can cause significant and unanticipated consequences when not properly considered in water-management plans. The types of water bodies that can be affected are highly varied, as are the potential effects.